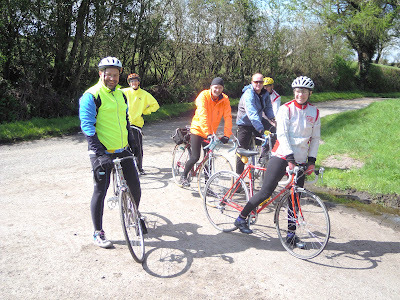 The first Sperrins lightweight ride was run on Sunday 15th April 2012. The run required bicycles equipped with multi-speed freewheels. The course was undulating with quite a few hills to test the legs and combat the cold. The weather was sunny with a noticeable drop in temperature in the shade. Quiet roads were enjoyed with time to view the wild flowers in the hedgerows, neolithic standing stones, buzzards soaring in the clear sky and fine views of the Sperrin mountains. Friendships renewed and good company enjoyed.